Iraqi food is rich and diverse, incorporating spices typical of Arabic cooking, such as saffron and mint. Extra food is usually cooked in case of surprise visitors, while expected guests are treated to many elaborate dishes. People eat their evening meal around 8:00 p.m. Most cooking is done on gas or paraffin-oil stoves, though in the cities, people often own microwave ovens to help shorten cooking time. For dessert, people enjoy some of Iraq's local fruits, rice pudding, Turkish Delight, date or sesame cookies, or baklava - a pastry made with honey and pistachios layered between filo sheets. Sift flour and sugar into a large mixing bowl. Cut butter into pieces and rub flour with fingertips until distributed evenly. Blend orange flower water or rose water with water and sprinkle onto flour mixture. Mix to a firm dough and knead lightly untl smooth. Rest dough for 30 minutes. Meanwhile, chop dates. Place in a pan with the butter and heat gently until dates soften, stirring often. Remove from heat and set aside. Roll dough into balls the size of a large walnut. Flatten a ball of dough in the palm of your hand and place a tsp of date filling in the center. 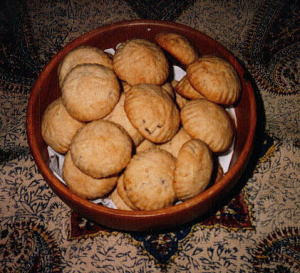 Mould dough around filling and reshape into a ball. Press ball into a carved mold similar to a tabi and place on an ungreased baking tray. Alternatively, place on a tray, flatten slightly and press tines of a fork obliquely around sides and across top, giving pastry a slightly conical shape. Bake in a preheated moderately slow oven (170 C or 325 F) for 30-35 minutes, until lightly browned. Cool on tray - pastries will become firm and crisp on cooling. Store in a sealed container when cool. Alternate shaping: Divide pastry into 3 equal portions and roll each portion into a rectangle 1/2" thick and 4" wide. 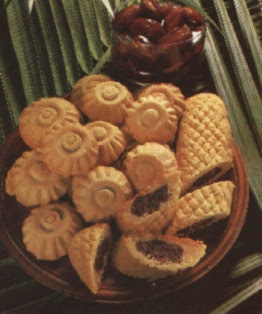 Put one-third of the date mixture, shaped into a long roll, along one edge of pastry and roll up to enclose filling. Press edges and ends to seal and place rolls joint side down, on ungreased baking sheet. Decorate top with pastry crimper or any other means to make a design. Bake as for Klaicha above, cool and slice at an angle to serve. Store in a sealed container. You have a fascinating site! I am going to make Klaicha this weekend and my recipe book states they should be rolled into crescent shapes - I far prefer the shapes in your photos!